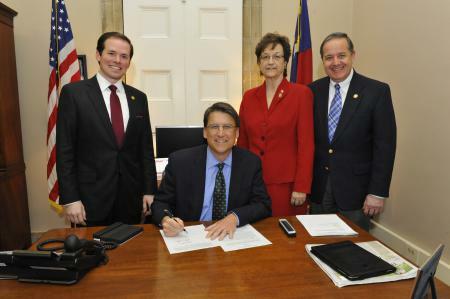 I’ve gotten lots of questions about health insurance coverage available to state politicians after we published the below picture showing NC Governor Pat McCrory and three members of NC’s part-time General Assembly at the bill signing rejecting billions of dollars from the federal Affordable Care Act for expanding Medicaid to 500,000 North Carolinians. NC’s Governor, a full-time state employee, can get the comprehensive 70/30 state health plan for free or, if he choses to pay $22.76 a month he can get lower cost sharing in the same plan (80/20). The legislators pictured, Rep Justin Burr (R), Rep Marilyn Avila (R), and Rep Mark Hollo (R) have a very special deal because they are legislators. In North Carolina, being a legislator is a part-time job – the General Assembly meets about six months every other year with a short three month session in off years. Unlike any other part-time state employee, the legislators pictured all get the same deal as the Governor and other full time state employees – either receive free coverage or pay $22.76 per month and have lower out-of-pocket costs. Currently 80% to 90% of legislators take this great deal. Too bad they couldn’t bother to provide 500,000 poor North Carolinians with needed health coverage as well. And your point is? These people as well as your Democrat friends are providing a service to the state. Maybe you need to help those 500,000 you keep referencing to get a job with the state or federal government. Both of those entities are hiring like gangbusters. At least then they would be providing a “service” to society and getting their healthcare like the majority of the rest of us. Oh, and you need to research if all those happy people in the photograph are actaully participating in the benefits of the government. Otherwise your headline is the usual sky is falling claptrap that makes this blog so misleading. NC legislators also have a special benefit not available to any other state employees – once they leave the legislature they retain the ability buy into the NC state health plan for the rest of their lives. They have to pay the full premium, but unlike any other even full-time state employee or any other employee in the private sector they can maintain their coverage for life. Nice trolling. You would be fortunate to be my neighbor. Doug, that’s not a valued piece of real estate. “Good fences make good neighbors” Robert Frost. I would add tall. They also get a very nice per-diem at our expense. Duke Energy employees get a really, really nice per-diem and they are now a branch of our state services right? I mean if it is welfare to help a kid get rid of a decayed tooth -then it is welfare when I pay for a Duke employee to go to college for free. I have to pay taxes and I have to pay for my electricity (thanks for that monopoly) , so the only difference I see is that I don’t mind helping the kid who is suffering- I mind very much paying for someone’s doctorate while they make over 155K a year. Republicans spend so much time worrying that someone is getting something for free, that they aren’t ; you would think they would resent the policies of our energy monopoly, but I guess they think another ph.d will create jobs. When will health care coverage double standards end? Such actions by the governor and legislators show where their heart and loyalty lay. Let’s comment to ending/slicing their future benefit package. But, but healthcare is a progressive right Sandra! These people would then be part of the thousands without healthcare….the horror!